A perfectly symmetrical and sculpted beard is possible with the Cut Buddy. It has a multi-curve patented design that’s easy to use and works like a charm. You can also shape your hair with this handy tool. The Cut Buddy saves you money by helping you get the best cut without the costly expense of continually going to the salon. Salons can be expensive and require a good amount of time out of your day. The Cut Buddy is perfect for anyone who wants to save time and money and look good! It’s an awesome tool that can help you achieve the perfect beard, mustache, neckline, sideburns, and hairlines. 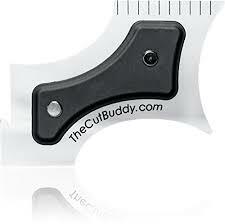 The Cut Buddy is compatible with all razors or trimmers made by Andis, Wahl, Conair, Remington, Norelco, and more. So you don’t need to worry about buying any specific fancy razor or trimmer to use this tool. Just grab your regular razor or trimmer, grab your Cut Buddy, and within minutes you can be looking studly. Cut Buddy has been featured by GQ, Black Enterprise, Forbes, NPR, and Huffington Post and is a best selling Amazon product! It’s no wonder since it makes trimming so fast and easy. Cut Buddy makes the perfect gift for a husband, brother, friend, son, father, or that guy in the office. With coupon code “INVNT” get 15% off your order of a Cut Buddy and these other awesome inventions like Cut Buddy that have been featured on Sharktank, Forbes, Entrepreneur, and Huffington Post.